Several years ago a friend of mine went to Cuba on a cultural exchange tour. When he told me he was going there, I did not even realize it was possible for an American to go to Cuba without taking serious risks. He explained that it was all above board, that they would have a strict agenda and that the US government viewed it as a humanitarian trip. When my friend came back, he verified stories of 1950s style cars driving on the streets and a place that seemed stuck in another time. He spoke of very friendly people with a focus on the simple, important things in life without the complexity of our 24-7-365 non-stop culture. While the country was indeed quite poor, he reported that its people seemed much happier than you would expect. When I heard last year that the New York Cosmos were going to play a match in Cuba, I immediately reached out to my ticket sales representative and asked if there was any way fans could go. My friend’s experience made me curious. If I could go and see Cuba along with my favorite soccer team, it would be an amazing opportunity. Much to my delight, the Cosmos made it possible for fans to join on their adventure. While I am a big supporter of the team, I must admit that my primary interest was in seeing Cuba before US relations thaw and commercialism takes hold. I wanted to see Havana as my friend described it, before Starbucks and McDonald’s start popping up on every other corner. The adventure began earlier than I thought it would. Traffic through New York City was at a crawl, even by Manhattan gridlock standards. I had left more than sufficient time for my 100 mile journey to JFK Airport under anything resembling normal circumstances, but the road congestion surpassed even the worst case scenario I planned for. Thanks to a decision to leave my car in a Manhattan parking garage and the good work of a NYC Taxi driver, I made it to the chartered flight area of the airport on time. After all, there was only one flight going to Cuba that day and it was not to be missed. At the charter terminal, we progressed through security as normal, except in this case among my fellow travelers were the players from my favorite soccer team. When we boarded the flight, we waited a little longer for a special passenger. Pele would be joining us on our trip. Later I would learn that NBA superstar Carmelo Anthony was also on board. The flight down to Havana was smooth, and had the atmosphere of a party. I fly regularly, and never before have I seen so many people out of their seats, talking to one another. We wait for our bags to arrive at baggage claim. Raul ponders larger issues. The Havana airport is small, and looks outdated, like many things in Cuba do. It was mobbed with well wishers. The fans and journalists exited the back of the plane, while the front exit was bombarded with flashing camera lights. 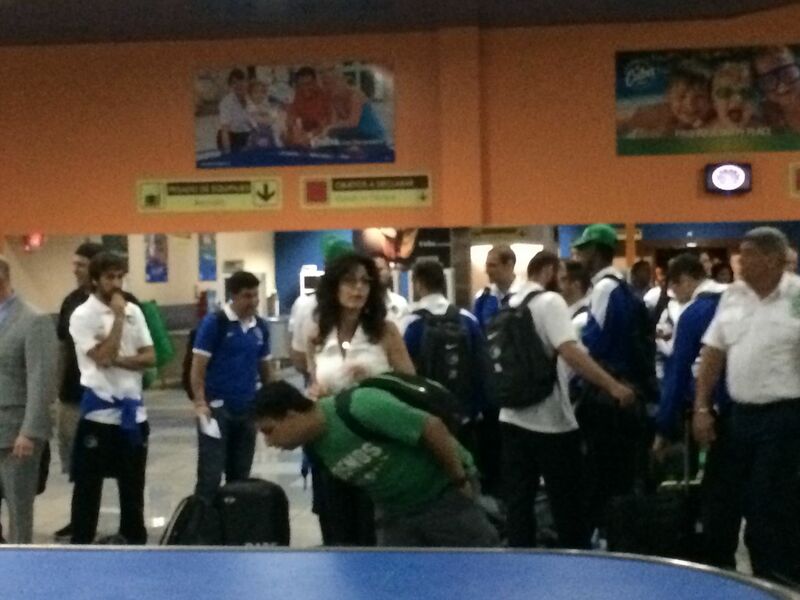 It is not every day sports icons of Raul and Pele’s stature arrive in Cuba. It was the first of many times us average citizens would have the strange experience of being in the immediate aftershocks of Pele and Raul’s extreme fame. Later in the trip, Jimmy Maurer would comment to us that he felt the same way. Since we arrived at the hotel very late on Sunday night, that was pretty much that. We checked in and went to sleep. Of course, the flight down itself had been the entertainment for that evening. The Cosmos put together a very nice itinerary for the people who came along with the team. Our group consisted of regular fans such as myself as well as some of the club’s staff and family members of the players and staff. Several of us went into the trip not knowing anyone. I banded together with three gentlemen named Gennadiy, Erwin and Richard. Gennadiy and Erwin are from Long Island and regularly attend matches. Richard owns an auditing company that worked with the team. We also spent a good amount of time with a couple from Westchester, Brian and Keira, who would later admit to being NYCFC fans who just wanted to see Cuba. The club historian Dr. David Kilpatrick was part of our tour group, as was Big Tom and his teenage son Christian, from KickALS.org, who brought a jersey he wanted the Cosmos players to sign. One of the Cosmos family members who made an impression was Arlene Gorskie, Hunter Gorskie’s mother. Arlene was very friendly and it was adorable to see how proud she was of her son. 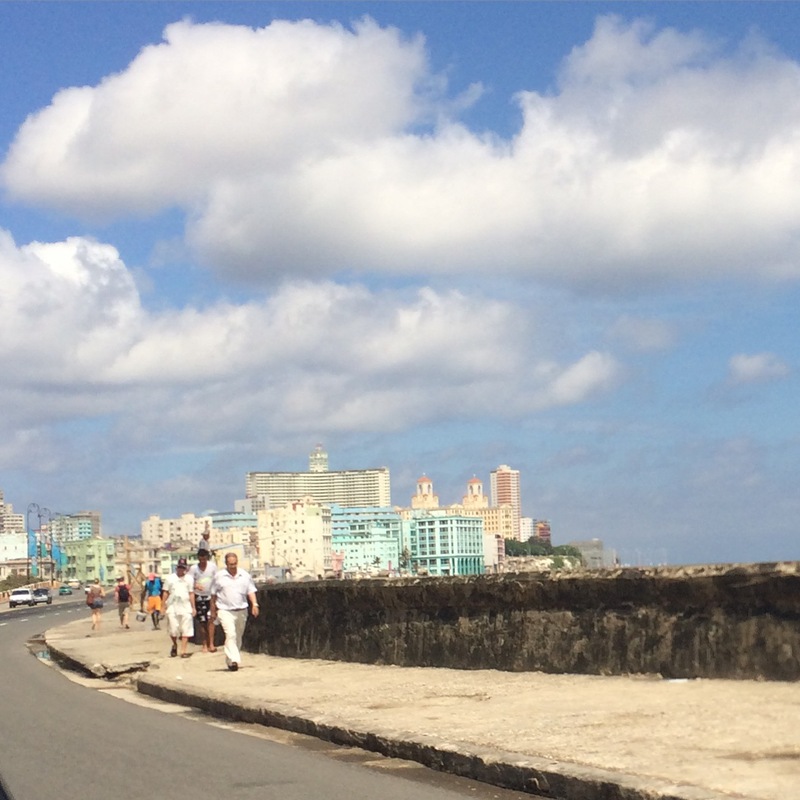 The tour of Havana began Monday morning. We went to the Havana Club rum museum. Rum like cigars is one of the staples of Cuba. On bus 322, the bus assigned to the fans along with some Cosmos staff, we had a wonderful tour guide named Elias. Elias described the history of what we drove by in Havana with a rich accent that added to the entertainment value of his descriptions. He was very friendly. Elias’ descriptions were from a Cuban perspective but balanced to not be offensive to Americans on the occasions where we came across monuments of conflict between our two countries. Elias embodied the vibe we got from the Cuban people in general: welcoming of us as guests, proud of his culture, ready to let the past to be the past and move forward to better relations in the future. The Cosmos had arranged for lunch at a paladar, a privately owned restaurant. Paladars are one of the few examples of private businesses in Cuba, where the government owns at least 51% of almost all businesses. As a result, you don’t find tax added to your charges when you are shopping, though Elias told us that taxes are coming soon. Perhaps this is a precursor to more privatization of industry. When finished at the paladar we headed over to the Romeo y Juliet cigar shop where many people stocked up on their maximum of $100 in value per person of cigars and rum that we were allowed to take back to the USA. Then it was off to the hotel for some free time before the evening’s welcome reception hosted by the Cosmos, with free mojitos and other drinks, hand-rolled cigars and plenty of appetizers to fill up on. 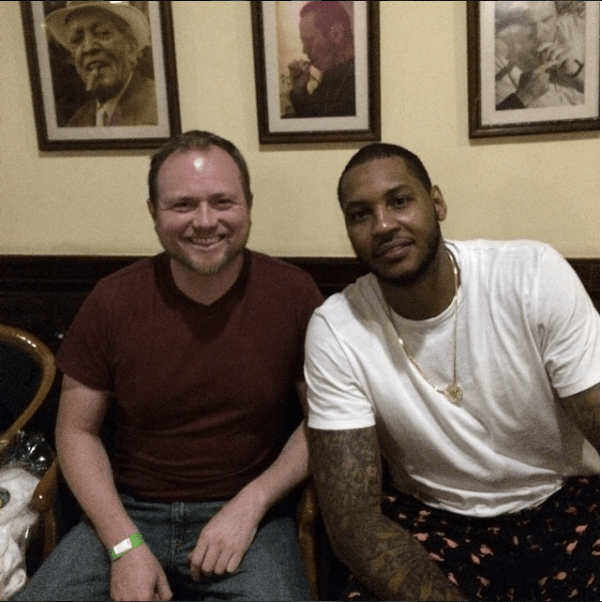 After my companions and I went to the hotel’s cigar bar, where we found Carmelo Anthony and his crew. Carmelo was gracious enough to take pictures with us before he headed out to another venue. Rumors about Carmelo investing in a NASL team swirled around the trip, from reviving the Puerto Rico Islanders, to starting a new Puerto Rico team by Fall 2017, to wanting to put a team in Havana itself. As we now know, those rumors turned out to be true as Carmelo’s Puerto Rico FC will debut in NASL on July 2, 2016. A less credible-seeming rumor shared by one of the journalists on the trip was that NASL’s long dormant Oklahoma City effort was not dead (although Virginia was). Later in the year we would find out that he was right, when Rayo OKC was announced seemingly out of the blue. I also ran into NASL Commissioner Bill Peterson on the trip, and asked him to get some teams in California. He assured me he was working on it. The following day was match day. In the morning, Elias took us to a marketplace in Havana, which resembled a flea market. Prices were negotiable and various products were on sale from clothing to leather goods to children’s toys to artwork. This was a great place to load up on souvenirs for family and friends. One interesting thing about Cuba is that your American credit cards and debit cards don’t work. You have only the cash you bring with you. That itself gets converted unfavorably. I converted US$100 and got 87 CUCs. Surprisingly, prices of items were pretty much in line with the USA, so your money doesn’t go further like you would expect. You are also pretty disconnected in Cuba, since your cell phone does not work. The hotel Internet was 14 CUCs for two hours of service, and the connectivity felt like a 56K modem. I went through 28 CUCs worth of service checking in on work and family during downtime at the hotel. Between the absence of all the technologies so ever present in our society and the streets filled with classic cars, visiting Havana felt like traveling back in time. 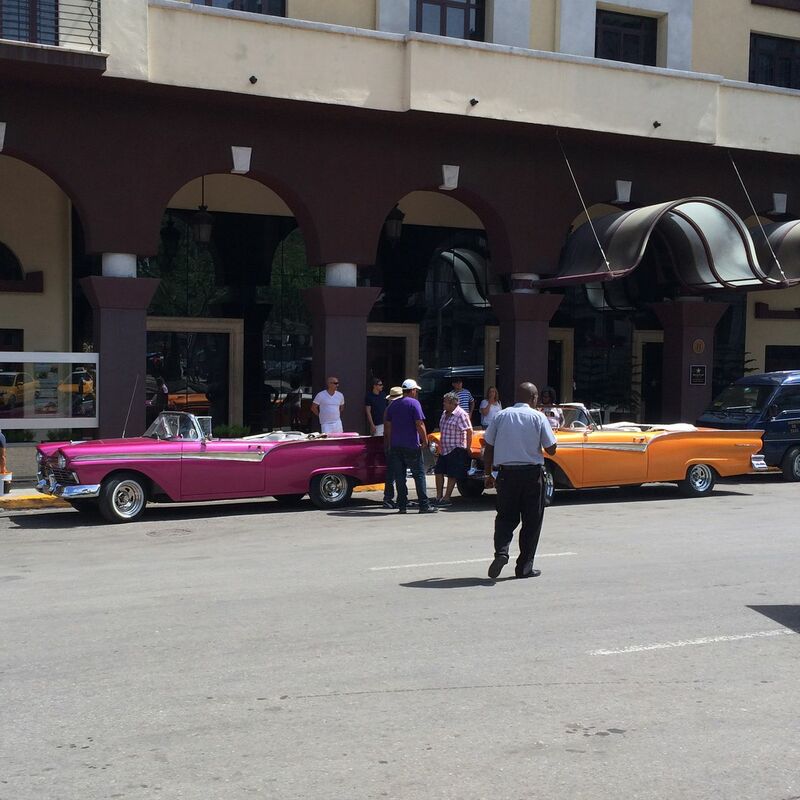 The classic cars are mostly taxis, because the average Cuban cannot afford a car. From the market it was back to the hotel for some free time until we headed over for the game. At 3:30PM, we loaded back onto bus 322 and headed over to Estadio Pedro Marrero. The stadium itself was not much to write home about, but the experience was amazing. The Cuban fans had loaded into the stands by the time we were let off the bus. Once we went through ticketing and waited for everyone to gather, it was time to head down to the seats. I happened to be the first of the American group to walk into the stands. The Cuban fans began chanting “USA, USA, USA” as we entered. It was an overwhelming and gracious welcome that sent chills up my spine. The others felt that way too. We made our way to our section and interacted with the Cuban fans around us with a kind of cautious curiosity. They were again very welcoming and soccer fans just like us. One section of Real Madrid fans began chanting something, and then some Barcelona fans chanted back at them in good nature. As you can imagine, everyone wanted to see Raul. Another spine tingling moment was when the Cuban youth choir sung the Star-Spangled Banner. A Cuban in the crowd waved the now-iconic double-sized Cuba-USA flag as the music played. It would have been easy to feel outnumbered and unsafe, but the Cubans made us feel like honored guests. The teams took the field after some ceremony, and began a match which quickly became more chippy than I had hoped for. After all, this was a friendly and my wish for the game itself was primarily that no one got hurt. As I was happy to good-naturedly remind Alecko Eskandarian during the trip, the key contest was coming up on June 17th, in the US Open Cup versus NYCFC. This friendly against Cuba was nice and all, but the priority should be keeping everyone healthy for the derby, I proposed. The Cosmos put a goal on the Cubans rather quickly via Lucky Mkosana. Then another came through Sebastian Guenzatti and another through Hagop Chirishian. Still in the first half, the general sense among the Cosmos fans I was around was “very nice boys, now take it easy a little bit since there are 15,000 Cubans behind us that we don’t want to upset.” Then Lucky scored again, a beautiful strike before half time. The Cubans remained gracious hosts. Fortunately for international relations, things settled down in the second half, the Cubans got a goal and no one got hurt. Well, aside from David Diosa getting jacked up like a NFL wide receiver catching a ball over the middle right in front of an awaiting linebacker. He would turn out to be OK. The game ended 4-1. To my amazement, Raul played all 90 minutes. We headed back to bus 322. It took a while for some folks to regroup, so we watched a heated discussion between some Cuban fans that appeared to be boiling over. It consisted of several gentleman yelling in each other’s faces, gesturing wildly and walking around each other confrontationally. Elias assured us this was normal post-game banter between friends. The bus took us back to the hotel, where after an hour to get changed the Cosmos had arranged for us to have dinner at the Havana Cafe, where we were entertained by the Grammy-winning jazz band, the Buena Vista Social Club. It was a heck of a show. From there we went to the hotel bar, where we ended up running into several Cosmos players, including Danny Szetela, Adam Moffat, Hunter Gorskie, Roversio, Hunter Freeman, Carlos Mendes, Hagop Chirishian and Jimmy Maurer. They were very friendly and took pictures with us. The players in general were happy to spend a little time with the fans. Maurer and Gorskie both talked to us for a while on at various points the trip, as did Mads Stokkelein. 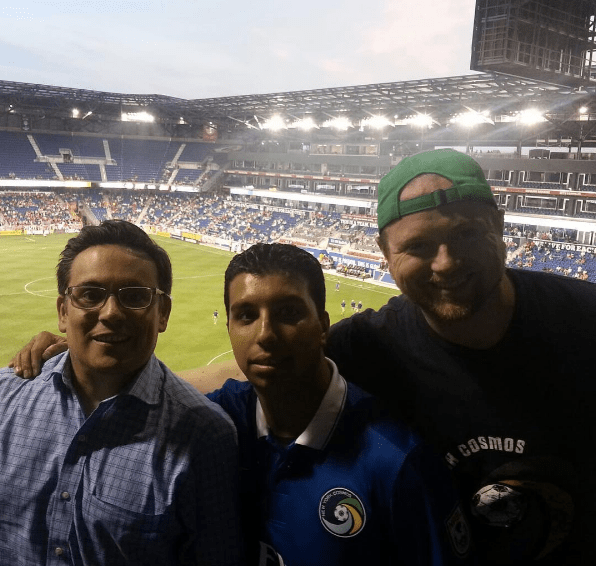 The Cosmos very friendly CFO Ricardo Venegas did not buy my pitch on why the club should sign up Didier Drogba, telling me he was pretty sure Drogba was set on MLS (and so he was). Very good guys and down to earth people. Gennadiy’s persistence paid off as he eventually got his picture taken with Raul, after his first attempt to do so earlier in the trip almost ended with him on the business end of Raul’s bodyguard. The following morning before the flight was free time, so Erwin, Gennadiy and I headed over to the Museum of the Revolution to take a look at history from a Cuban point of view. One thing that I found interesting there was that it was much less Fidel Castro-centric than I was expecting. Beyond that, Raul Castro was not featured very much at all. The reverence was spread fairly evenly among a group of “founding fathers” in Fidel Castro, Che Guevera and Camilo Cienfuegos, as well as the poet Jose Marti who was cited as an important inspiration for the revolution. The emphasis seemed to be on the Revolution as a movement, rather than on any particular individual. 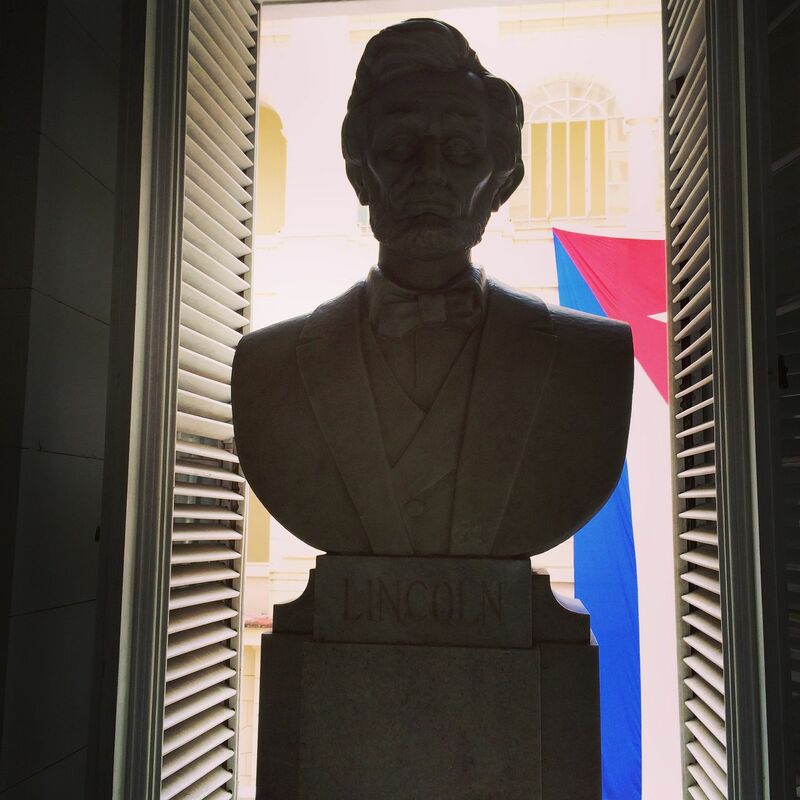 There was even a bust of Abraham Lincoln their museum, as the Cubans admire Lincoln. From there, it was back to hotel to pack up and head to the airport. You didn’t want to miss the flight back home, as it might be a while before you could catch another. At the terminal, I was able to get a picture with my favorite Cosmos player, Marcos Senna. More importantly, young Christian was able capture on his jersey the signature of the greatest Cosmos player of them all, Pele, just before the flight. After an uneventful if somewhat delayed flight back to reality, everyone’s faces went back in their cell phones to catch up on several days of messages. Two weeks later, Gennadiy and I met up at Shuart Stadium to take in the much anticipated NYCFC Open Cup match. From a Cosmos fan perspective, it was everything you could ever have hoped for in a sporting event. We all know the story, one that you could not script any better. The home team went down by two and rallied back on late goals by Leo Fernandes and Lucky Mkosana. NYCFC blew a kick from the spot in extra time, and we went to penalties. Jimmy Maurer came up huge and Hunter Gorskie put the game away. The Cosmos were kings of New York soccer (for a few weeks). Shuart Stadium had an electric atmosphere that night, and like the rest of the crowd we exploded when Hunter scored. Amidst the euphoria of an incredible victory, Gennadiy and I scanned the crowd to see how Arlene was doing. We spotted her, tears flowing, and as always so proud of her boy. Two weeks from now, Gennadiy, Erwin and I will take in another US Open Cup derby against NYCFC, this time at Fordham. We will hope for another Cosmos victory, much to the chagrin of Brian and Keira. The trip to Cuba with the Cosmos had many wonderful elements. Seeing yourself flicker by on the screen while watching a documentary (A Bridge to Cuba) and finding an image of yourself at the match on Getty Images is pretty neat. 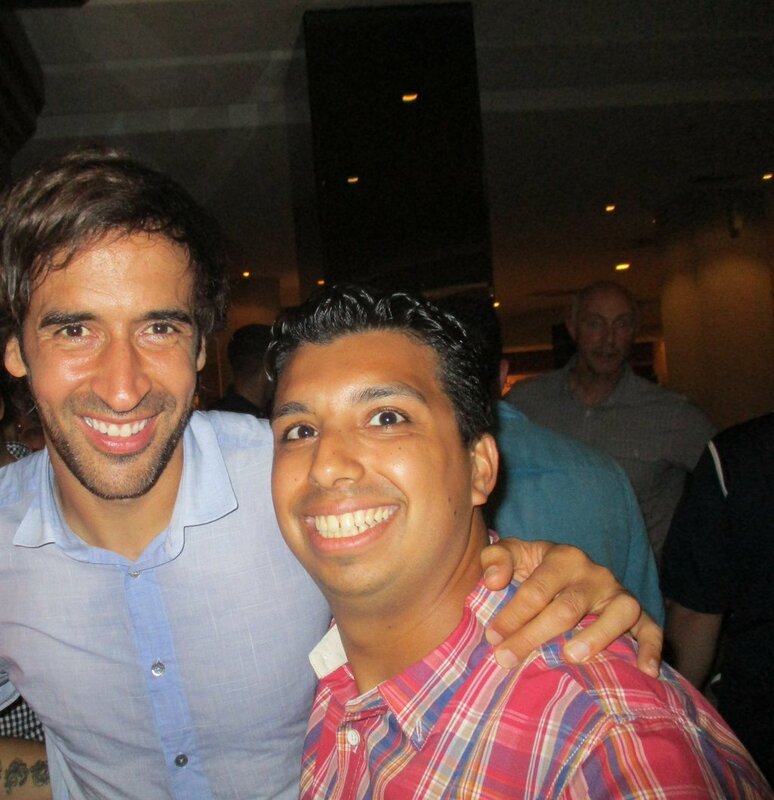 Spending time with the Cosmos players and staff was a lot of fun. 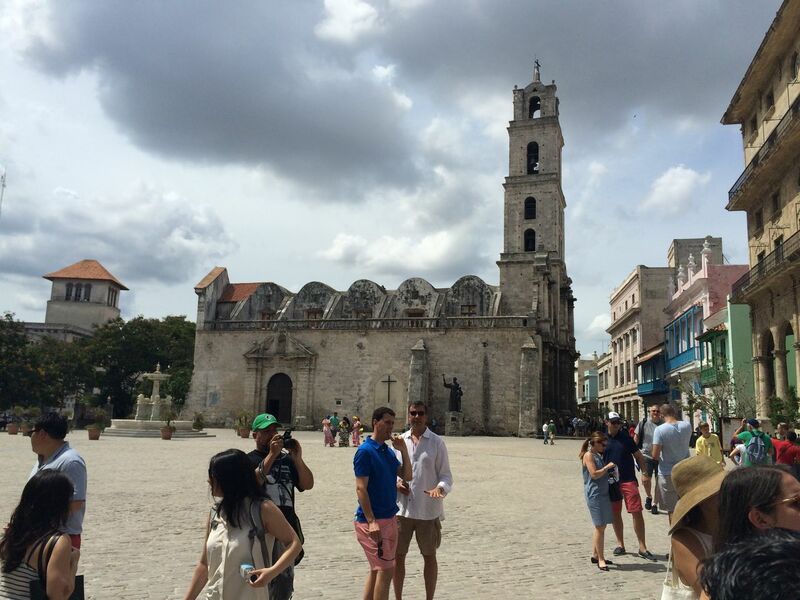 The beautiful scenery of Havana and its generous people such as Elias were unforgettable. Ultimately the relationships forged with other people on the trip were what meant the most. Cheering aside them makes every Cosmos match after the trip that much more special.